We Ontarians don't drink enough of our own wine. Only just over 4 bottles in every ten consumed come from our own industry, compared to nearly 10 of 10 in France and 9 of 10 in Italy and Australia. Here we aim to be a force for moving that market share number closer to where it belongs and to what our wines deserve. Many business people lack the information necessary to make good decisions about whether or not to invest in online video in their marketing efforts. Not only is it relatively new in its current forms. It just won't stop evolving. My contribution to clearing the air is presented in four illustrated pages available here. If you are one such as I've described I hope you find this helpful and want to talk more about it. If you know someone who might benefit from the information I hope you will pass the link along. Clearly I haven't been around these parts much for several months. A specific event brought me back to a keener interest in wines and other interests have since captured the spotlight. I'm back today to tell you about a website that provides access to news of local wine events virtually wherever you live. Once you identify your spot on the map you will begin to receive email notices of tastings and functions and festivals, along with reviews, and informative bits about products (how about wine wipes, for removing red wine stains from your teeth? ), wine travel and more. Here in Toronto, Canada the provider calls itself "The Juice" and recently began offering a premium service that I haven't got up to speed with yet. I hope you find something that merits the time. I was into one of the grocery outlets in my neighbourhood recently, one just over a renovation and name change. The Ontario wine store within has also been renovated - and yes, they've changed their name too! It's a good thing that people don't do this. But I digress. The wine store formerly known as Vineyard Estate Wines is now Aisle 43, owned and operated by Andrew Peller Estates, formerly known as Andres Wines. In addition to a new design concept (think Shoppers Drugmart) they've signed and sorted by price band - under $10, $10-15 and so on. This location was short a few things, like backlit posters and a store sign, but that will sort itself out in the next days and weeks. It is a bright, clean and airy space with product providing most of the colour. I needed a visit to their new web site to discover the origin of the name. As they put it, it's all a matter of latitude. The 43rd parallel to be specific. A line across the globe they share with Burgundy and Tuscany. When I remarked to the Store Manager that the new look had none of the old wine snob's cellar in it, she replied that wine is really just milk for adults. Chardonnay over Captain Crunch, anyone? "The Liquor Control Board of Ontario said that wines endorsed by Wayne Gretzky will sell 18,000 cases (or $2.7 million) over the next 12 months, and wines endorsed by Dan Aykroyd over 11,000 cases ($1.7 million). Both were among the top-10 bestselling wines of 2007. Spokesman Chris Layton said all new celebrity wines have been selling well and significantly better than new, non-celebrity brands." The same article described a deal between The Rolling Stones and Ex Nihilo Vineyards Inc. near Kelowna, who have begun marketing a limited-edition icewine called "Sympathy for the Devil." 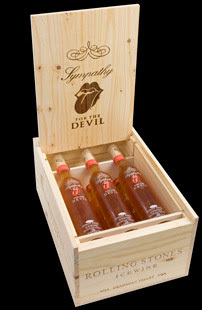 Each bottle in the 222 cases of their Rolling Stones icewine will be hand-numbered. Mick didn't go to the London School of Economics for nothing it seems. The price? - $125 per bottle. I received an invitation recently which made me curious about the state of Canadian wine retailing outside of my home province of Ontario. In a very few minutes I discovered that Alberta supermarkets sell International wines and that in British Columbia, where I toured Cold Beer and Wine Stores fifteen years ago while in the Ontario industry, there is a much expanded distribution system that now includes more than twenty VQA store licenses. I also came across a site operated by a group called the "Ontario Wine Producers". This winery organization makes a strong case for wineries participating in more than one industry association, comparing gains made in BC, which has two strong groups, to absent or weaker progress in Ontario, where the Wine Council of Ontario (WCO) predominates, and is described as threatening "ruination" should a second voice gain volume. In supporting its own argument for an additional voice, the OWP quote an impressive statistic from the BC marketplace. Annual Provincial Liquor Board sales of BC VQA wines are 18.4% by dollar value. The Ontario number is a disappointing 3.8%. The OWP argues that the variance is the result of strong industry voices in BC versus a single voice in Ontario, and one they suggest takes its cue from the best interest of the largest vintners in the association. It's a difference of opinion worth watching. Today there is no crop shortage to justify allowing so much foreign content in our wine. In fact, grape growers are facing potential crop surpluses and depressed prices because the current wine content act is hurting our industry. We want consumers to understand what they are buying, and support wineries that produce 100% Ontario wines. One can sympathize with their position. The wines they're talking about currently outsell VQA (100% Ontario grapes) by a factor of 3 to 1. Isn't it a bit strange to contemplate the possibility that our wine industry is supporting other country's wine industries, buying what might be surplus some years to supply demand for a "made in Canada" product that only has to be 30% Canadian? Maybe it's just me. Would You Like French with your Ontario - or Algerian, or...? When I entered the Ontario wine industry in 1985 Chateau Gai's main market excitement came from a product called "Canada Cooler". We paid a lot of homage in those days, in this case to California Cooler, which was huge in the US youth market, and soon thereafter to French wine, with the launch of "L'Escapade", a dry white with foreign wine blended in and a TV commercial featuring the Eiffel Tower. You may not have considered it before, you may not have been aware of it, but L'Escapade illustrates a key point about Ontario's wine industry. It stands alone around the globe in depending on wine from other countries to make its own. Take a moment to digest that. The image to the left comes from the website of the Grape Growers of Ontario. It explains the blending rules currently in place for those wineries which have the right to use imported wine in their bottled product. The privilege was withdrawn in 1993 but wineries operating before that year and who had taken advantage of the right, continue to enjoy it today. To make the point crystal clear let me in memory walk you around behind the winery in Niagara Falls where we could watch foreign wine being pumped out of 200-Litre plastic bags, called "flexitainers", which traveled by ship, train and truck from whatever country made the wine - and it could be just about anywhere where price and minimum quality came together. My recollection is that this right had to do with a higher demand than the grape harvest could satisfy. The noble grape varieties were not much grown in Ontario in the early 1980's, although the situation was beginning to change. So to make a decent table wine meant using wine from elsewhere to supplement what we had at home. Twice in the past six years harsh winter conditions have ushered in a short crop and the blending rules have been adjusted accordingly, meaning a higher proportion of foreign wine to fill the gap. Depending on how much off-shore content is used the wines made this way are labeled either "Cellared in Canada" or "Product of Canada". Such wines come almost entirely from two wineries, the giants of the Ontario industry, creations of mergers and acquisitions over twenty years - the largest of them now wholly owned by a New York State based global wine marketing machine known as Consolidated Brands. Those two companies are Vincor Canada and Andrew Peller Limited. Their retail chains are "Wine Rack", which I ran for ten years, and "Vineyards". Both also participate heavily in the "real" Ontario wine market, the one built around VQA, products approved to wear the designation by a body called the Vintners Quality Alliance, which above all else means 100% Ontario wine content in every bottle. But let's save this discussion for another post.